Apparently there is a giant room at the Kierland Resort is Scottsdale dedicated to more than 200 different types of Scotch and whiskey. I have also heard a rumor they have a tasting room. I have no idea what the cost for tasting flights is, but all I know is, as a Duncan and a person who likes whiskey. Scotch and Bourbon—I must go some day before my time in AZ is up! Methinks I will need an Uber driver to take me home that night. Either that or a suite. If you watch the film Almost Famous, there’s a memorable scene where the band comes to Phoenix. This scene was really filmed at the Roosevelt Hotel, Hollywood Boulevard, LA, but damn–it sure looks like La Posada, an historic and very beautiful old hotel in Winslow, Arizona. I read about La Posada and world-famous Turquoise Room in a travel magazine three or four years ago and ever since, I have been salivating for the dishes created by Chef John Sharpe. The photos of the food make it look like the best U.S.-inspired Southwestern cuisine on the planet (I can forgive him for being British). The architecture makes you dream of a beautiful villa in Spain. I vow that we will stay over night at La Posada and dine at The Turquoise Room some day! It might be hard to believe, but somewhere sitting out there in the desert, just a little bit south of Tucson in Sahuarita is a complete, once-fully-operational missile launch site. It’s just sitting out there in what I imagine are a big group of silos and underground secret buildings. I don’t know, because I haven’t been yet. But you better believe this one made the AZ Bucket List! I’ve been wondering about this place since I lived in Tucson, circa 1999-2001, and used to see the billboards all the time. I had a friend who was very into photography, and a couple times we went and skulked around the airplane graveyard. That was incredibly fun, thrilling and interesting, and I can only imagine an old, fully-automated missile launch area is even more mind-blowing. The Titan Missile Museum used to be known as Air Force Facility Missile Site 8. It was deactivated in 1982. The Titan II was the largest land based nuclear missile ever built or used by the United States. The only time I’ve ever spent in Bisbee was on a day trip that I took by myself. I drove for what felt like all day from Phoenix. By the time I got to Bisbee, the sun was high and I got thirsty fast. Still, I walked around this little, charming, oddball ghost town, looking into windows of art galleries, roaming around noting the weird paint job on a lot of the classic old mining town houses, and wishing I had more time to actually go INTO the mine (I love going underground). I also wished I knew someone local who could show me around. I wished I’d done some research and found a good concert or art event to go to. I also wished I had a room at the Copper Queen Hotel, because I was NOT looking forward to the five-hour drive back home. But rates were really high that night—about $250 (it was a weekend in the dead of summer) and I just couldn’t rationalize this expense for little ol’ me. Instead I sat in a bar that was completely dead and ate a hamburger, talking to this dark-haired bartender dude who was the epitome of hippie. 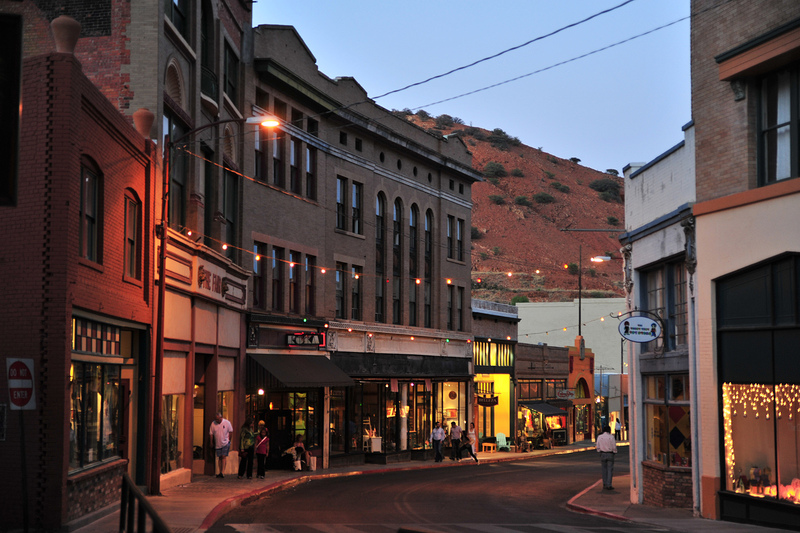 I’ve been dying to go back to Bisbee and actually spend a little more, but I have not had the occasion. This would make for one excellent stop on a group road trip, I’m thinking! Shady Dell is an entire trailer park full of old (but cute!) fully restored Airstream RVs. For a very affordable fee, you can drive down to this park near Bisbee and stay in a trailer fully made up to look like the 1950s. We are talking vintage couches, record player, cute dinette set, tiny mobile kitchen—the works. They have about 10 of these adorable refurbished models ranging from the years 1947-1959 with cute names such as the Tiki Bus, Spartanette and El Rey. On two different occasions I had reservations and serious plans to go down to Shady Dell. And on two different occasions some big life event happened and I had to cancel. I’ve been disappointed about this since the year 2000. I’m not a big vintage clothing fan, but I do love to go visit relics that remind us of a time in AZ past, so add Shady Dell to my AZ Bucket List Southern Arizona weekend getaway plans!